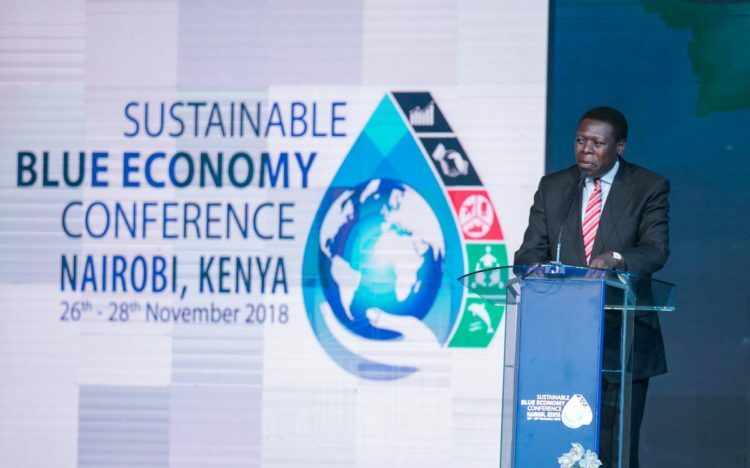 Devolution Cabinet Secretary Eugene Wamalwa has said Kenya is seeking to learn from major cities in the world situated along oceans, seas and lakes during this Blue Economy Conference at the KICC. Speaking at the Conference on the 2nd day, CS Wamalwa acknowledged that 3/4 of all large cities in the world are located along water bodies, “Highlighting the importance of water bodies in the establishment and growth of urban areas. We are therefore seeking to learn from these cities of the world on how to unlock the potential of our own cities and towns like Mombasa and Kisumu,” he said. He added that this goal is in line with the Sustainable Goal 14 which concerns the conserving and sustainable use of the oceans, seas and marine resources for sustainable development. He said it’s also in line with SDG1, for ending poverty, SDG2 which concerns food security and SDG8 which concerns decent economic growth. Furthermore, the Devolution CS said the youths stand to benefit more from the Blue Economy Conference, given that they are the majority in the cities and countries taking part in the conference. “They’ll be the majority of beneficiaries for what we do here.” He said they’ll focus to ensure they work together to make the conference a reality.